United Airlines told NBC 5 it was a "tragic accident that should never have occurred, as pets should never be placed in the overhead bin"
Chicago-based United Airlines is accepting responsibility for a dog's in-flight death after a flight attendant ordered its owner to put the pet in the overhead compartment. A passenger boarded United flight 1284 from Houston to New York Monday night with the dog inside a TSA-approved carrier, the aviation website "The Points Guy" reported Tuesday. United Airlines told NBC 5 it was a "tragic accident that should never have occurred, as pets should never be placed in the overhead bin." "We assume full responsibility for this tragedy and express our deepest condolences to the family and are committed to supporting them," the airline said in a statement to NBC 5. "We are thoroughly investigating what occurred to prevent this from ever happening again." The passengers heard barking for part of the flight, The Points Guy reported. But by the end of the trip, the dog had died. Passenger Maggie Gremminger told aviation website One Mile at a Time that the dog owner "adamantly pushed back" on the flight attendant's demand for it to go in the overhead compartment before she eventually complied. She called it an "out of body experience of grief." "By the end of the flight, the dog was dead. The woman was crying in the airplane aisle on the floor," Gremminger told One Mile at a Time. She said another passenger offered to hold the grieving dog owner's newborn while she cried in the aisle with the dog. United spokesman Charles Hobart said the flight attendant told the dog's owner to put the pet carrier in the overhead bin because the bag was partly obstructing the aisle. 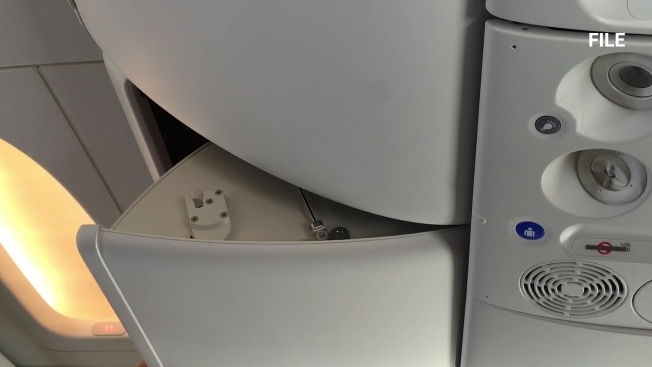 It is unclear why the carrier was not placed under a seat, he said. Hobart said United is investigating the incident and talking to the flight attendant, whom he declined to identify. He said the airline refunded the tickets purchased for the dog owner and her two children and the fee that they paid to bring a pet on board — typically $200. According to the airline's website, pets are allowed on most flights within the U.S. In-cabin pets must travel in approved kennels that can fit completely under the seat, where the kennel must remain at all times. The cause of the dog's death was not immediately known. The spokesman said United offered to pay for a necropsy. Last year, 18 animals died while being transported on United — there were six cases on all other U.S. carriers combined, according to the Department of Transportation.